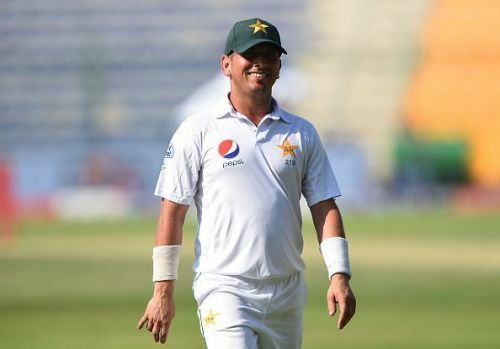 Yasir Shah's recent 14/184 against New Zealand was one of the most exceptional bowling performances in modern cricket, and was also the second greatest match figures by a Pakistani bowler, just behind Imran Kahn's 14/116 against Sri Lanka. What is most notable, however, is that Yasir Shah's extraordinary bowling performance makes it almost a certainty that he will become the fastest player to reach 200 wickets in Test cricket. The current record holder and the man who has held the record for over 82 years is a fellow leg-spinner in Australia's Clarrie Grimmett. Grimmett reached the 200 wicket milestone in just 36 matches, but it is nearly inevitable Shah will break this record, as he now has 195 wickets to his name in just 32 matches. Like Shah, Grimmett was a late-bloomer, although Grimmett made his debut at age of 33, whereas Shah was 28 when he played his first Test. In fact, Yasir Shah has taken his 195 Test wickets so quickly that he is still younger than Grimmett was when he debuted. Since Grimmett set this record, others have come close to equaling him. Ravichandran Ashwin came close, only missing out on equaling the milestone by a single Test. Whereas as Dennis Lillee, Waqar Younis and Dale Steyn all took less than 40 Tests to reach 200 wickets as well. Yasir Shah's short career has been both strange and eventful. His Test debut, for example, only came as a result of Saeed Ajmal being banned for an illegal action just ahead of Pakistan's Test series against Australia. Shah was therefore chosen alongside Zulfiqar Babar to make up Pakistan's spin attack for the series opener in Dubai. However, Pakistan's captain at the time, Misbah-ul-Haq, did not appear overly convinced of Shah. He only gave the leg-spinner 16.3 overs in Australia's first innings, while bowling Babar for 27 overs, and even giving Mohammad Hafeez 25.4. Shah, however, still managed to make an impact taking three wickets including those of David Warner and Steve Smith. Misbah would show more trust in Shah in the second innings, and Shah would reward him with a further four wickets. In the intervening series, Misbah came to rely on Shah more an more. Epitomizing this is that in his 32 matches, Shah has bowled over a hundred overs more than Vernon Philander has in his 55 matches. Yet the short time Shah has spent as an international cricketer has not been seamless. Late in 2015, Shah tested positive for chlorthalidone, a banned substance. This brought comparisons to Shane Warne's 2003 doping ban, where the similarly in form leg-spinner was given a 12-month suspension from international cricket. However, Shah would only be suspended for three months and was soon back on the international arena. Shah has also had some difficult series outside of Asia. Shah averages just 24.27 in the United Arab Emirates, where he has taken the majority of his Test wickets, yet he averages an unconvincing 40.74 with the ball in England, and an even worse 84 in Australia. It is obviously natural for a spinner to struggle more in these nations, but Shah's statistics may be skewed to this extreme extent because he was never able to experience playing in these countries earlier in his career. This meant that by the time Shah played his first Test in Australia, for example, Misbah-ul-Haq was already very reliant on him. Shah subsequently bowled more overs than anyone else in the series, despite going at 4.54 an over and rarely looking threatening. However, despite this, Shah is still likely to be quickest to the 200 wicket mark by some distance. This highlights just how devastating he has been when at his best. In 2016 when Shah's match figures of 10/141 handed Pakistan a surprise victory at Lord's, he became the first leg-spinner in 11 years to top the ICC test bowling charts. That so much time had passed since a leg-spinner held this title shows just how rare it is for someone to excel at the art. In the ongoing New Zealand Test series, it is likely that Yasir will pass another former master of the art when he breaks Grimmett's 82-year-old record.